Each program encourages and promotes creativity, cooperation and community building; and helps to foster kids’ self-discovery, empathy and compassion in action. 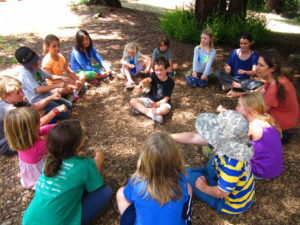 Campers will develop their social, emotional, cognitive and physical skills. All programs are taught by experienced Mount Madonna School (MMS) teachers. Transportation is available from Soquel, Corralitos, Gilroy and Morgan Hill. Time and location details will appear once you have begun the registration process and selected the week(s) you would like to attend. Transportation will be provided in vans driven by MMS teachers and staff. 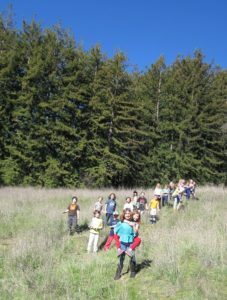 Children entering kindergarten and first grade will have the opportunity to experience our mountain school through outdoor exploration, gardening, arts, crafts and story time. 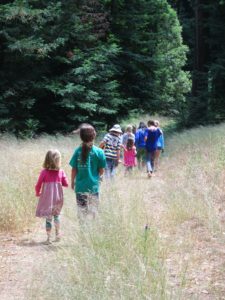 Daily activities will center around our beautiful campus environment with hiking and forest play. Children will be introduced to various artistic mediums and hands-on activities. We will spend time gardening, harvesting and preparing food together from the MMS children’s garden. Children will learn about yoga, meditation and mindfulness, and have time to practice reflection and creative self-expression. Storytelling and literature will foster positive character development through the exploration of friendship, right actions and kindness through social interaction. For these programs, children will have the opportunity to explore the mountain and grow their appreciation for nature while hiking, learning and playing in the forest. 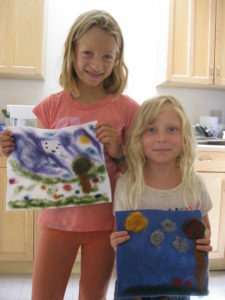 Campers will create art using a variety of mediums to produce their own pieces and share in collaborative works. 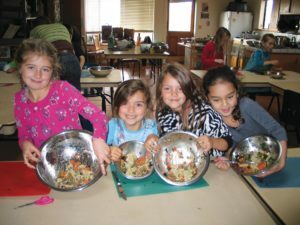 They will experience the joy of harvesting from the Mount Madonna School children’s garden and preparing food to share together. Children will learn about yoga, meditation and mindfulness, and have time to practice self-awareness, reflection and self-expression. Storytelling and literature will foster positive character development through the exploration of friendship, right actions and kindness. 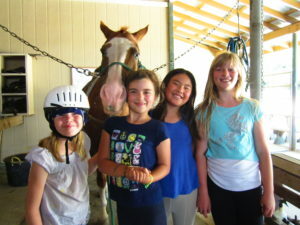 Children entering 1st-8th grades are invited to enjoy afternoons of learning about horses at Mount Madonna Stables. This program has been educating riders for more than 20 years at their state-of-the-art stables, located just minutes away from MMS. The stables provide a safe environment and this program is designed for all levels of riders, beginners through advanced, with a knowledgeable and experienced staff. Their team helps each rider learn and improve their skills while having fun. The half-day program requires enrollment in a full-day summer program at MMS. Transportation between MMS and the stables is provided by MMS vans. All riders will be picked up at MMS at lunch and brought to the stables, and driven back to MMS at 3:20pm for pick up. The stables will provide helmets. For this new program, students will have the opportunity to learn Spanish at an accelerated rate in fun and creative ways. As a native Spanish speaker and performing arts teacher, Carolina will engage the students in conversational Spanish at their level, while encouraging them to speak Spanish with more fluency. There will be a variety of fun activities, along with some cultural awareness and education. Mountain Fit Club is all about participation and having fun! Enjoying 355 beautiful acre, students are encouraged to push their boundaries with positive reinforcement, where building self-esteem and building friendships are key. Different types of exercise and fitness games are offered in a fun, non-competitive and non-intimidating environment. Sports of all Sorts: Basketball, Tennis, Sand Volleyball, and much more! Mountain of Art is all about exploring our creative sides with an immersion into the visual arts. Using a variety of mediums, these student-artists will get a combination of guided art practice, along with freestyle to allow each individual’s unique creativity shine through! There will be an artists’ reception on Friday, July 19th at 2:30, after which your child will take all their artwork home to enjoy for years to come. Enjoy a full day of learning about horses at Mount Madonna Stables. This program has been educating riders for more than 20 years at their state-of-the-art stables, located just minutes away from MMS. 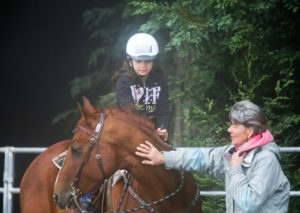 The stables provide a safe environment and this program is designed for all levels of riders, beginners through advanced, with a knowledgeable and experienced staff. Their team helps each rider learn and improve their skills while having fun. Questions? Contact our Summer Program coordinators.